On November 2, 1936, BBC engineers at Alexander Palace transmitted what is often claimed to be the world’s first television program. However, the world’s first public television transmissions had begun in Berlin, Germany, the previous year. Adolf Hitler became absolutely furious, upon hearing BBC boasting the claim to be the first broadcaster to transmit a television program. On March 22, 1935, the first regular television program in the world was broadcast from an aerial on the top of the Funkturm Berlin tower. Since 1962, the tower is no longer used for TV transmissions. Nikola Tesla had actually predicted back in 1915 that mankind would produce technology that would allow him to transmit voice and images. In 1936, his prediction did become reality. Tesla was right about many things. On a special television cable the picture of the speaker in Berlin is transmitted to Leipzig and vice-versa. In this way the two persons are able to see one another and to converse simultaneously over a telephone wire. This is 1936 in Berlin, Germany. 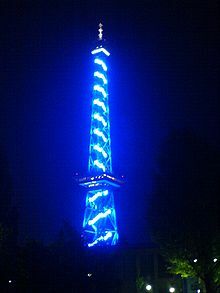 On August 25, 1924, the Funkturm Berlin tower would transmit a radio program. The radio tower ‘Berliner Funkturm’ was opened to the public on September 3, 1926. Albert Einstein made the opening speech at the 1930 Wireless Exhibition (Funkausstellung) at the foot of the radio tower. The Funkturm Berlin built between 1924 and 1926 by Heinrich Straumer, which is nicknamed “der lange Lulatsch” (“the lanky lad”), is a point of interest in Berlin. Since 1973, the radio tower no longer serves as a regular transmission tower for broadcasting purposes, but it is still used as relay station for amateur radio, police radio, and mobile phone services. MapQuest provides some extent of street-level detail and/or driving directions for a variety of countries. Users can check if their country is available via a pull down menu on the MapQuest home page. A MapQuest-branded Yellow Pages service is provided by AOL. Other services include a world atlas and MapQuest Mobile. MapQuest Mobile is a service providing maps and driving directions to any Web-enabled mobile phone or personal digital assistant…”.